From now on, stop pinning all those holes in your parquet floor. This system will render your work a lot easier: our secret nailing system is a revolutionary innovation in the field of putting 9 mm top floor parquets. While most professionals put a traditionnal 9 mm floor by nailing it to the wooden subfloor with pins, through the board, leaving visible holes made by the pins, this system allows you to put a perfect board, without deliberately destroying it as if it was a Swiss cheese. Most of these little damaging holes are filled with wood-coloured filler, but for the fitter, they are nothing but an annoying waste of time, not in the least because after sanding, a lot of pins need to be sunken deeper the manual way, the holes they leave filled again. The client also asks some questions, why all those holes are neccesary: plain damage to a beautiful parquet, filled with something that will come out again some day, collecting dirt, accentuating even more the holes drilled by the pinner. 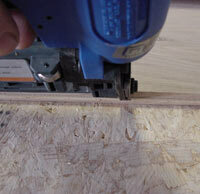 Therefore, we advance the Snap-Tack secret nailing system for boards up to 22 cm wide. These boards are nailed in the tonges, which hold down the next board in its groove. You will be fitting this floor as fast as you did before and you minimize the damage from on top: no more little holes to fill. However, sometimes a nail from above is needed, especially with the ends -but at a ratio of 1 nail per square meter, you will see the difference. It's an advantage: no holes means no filling, no additional work after sanding and less work sanding; The result is a perfectly fit wooden floor and a satisfied customer. 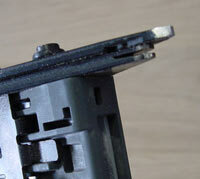 Snap-Tack is available on all our 9 mm floors without additional cost. 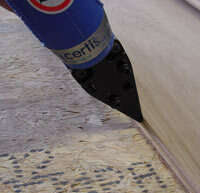 It's the perfect solution for DIY as the system requires very few sanding skills.